Implement a robust BI Reporting strategy that facilitates truly insightful decision-making. But successful business intelligence requires a well thought out strategy and approach to ensure that decision makers have the right information. SQL Power consultants are experts at designing and delivering BI strategy and solutions. Our proven methodology, developed throughout our 20 years of delivering BI solutions, ensures that every step of your BI implementation is successful - from strategy and plan through to design and deployment, knowledge transfer, and ongoing support. With over 20 years of experience delivering BI strategy and BI solutions, the SQL Power consulting team has the expertise to help you define and implement the right BI Strategy so that your business has the business intelligence it needs to thrive in this difficult and highly competitive global market. To maintain your organization's competitive edge, you need your business intelligence environment to deliver the right information quickly and accurately. Despite increasing demands, changing requirements and scarce resources, failure is NEVER an option. Through dedication and innovation, we deliver business intelligence solutions of the highest quality to value-oriented clients. Whether you're building an enterprise data warehouse, a data mart, or an operational data store, SQL Power consultants can help expedite and de-risk your decision support implementation. 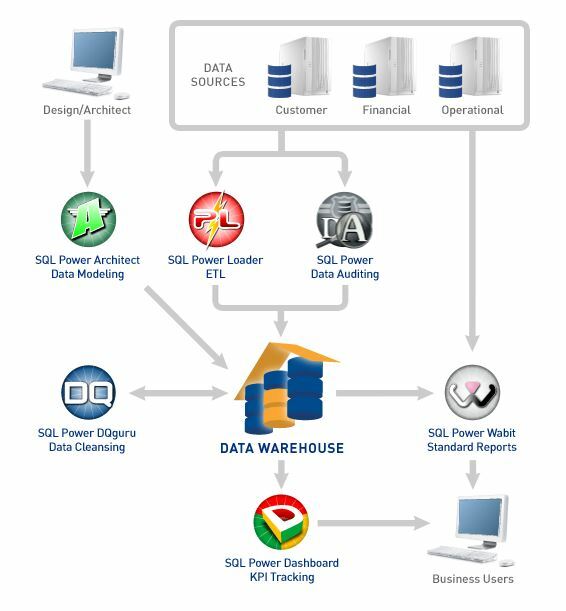 Using our proven data warehouse design philosophy, SQL Power consultants have successfully architected and implemented numerous complex data warehouse and data mart projects. These experiences have equipped our consultants with proven solutions to the many intricate data warehousing problems. Having these readily-available solutions in our arsenal serves to simplify our data warehousing implementations, and affords us the ability to concentrate on our clients' truly unique data issues. SQL Power consultants also bring to the table a complete suite of SQL Power Tools to streamline data warehouse productivity. We will supplement your software investment with our proven productivity tools, thus enhancing productivity and expediting data warehouse implementations. Proven methodology, highly-skilled consultants and state-of-the-art productivity tools have established SQL Power as the premier business intelligence solution provider in Canada. We will surpass your expectations and successfully deliver the right solution on-time and within budget.